Is It Safe to Drink Lipton Green Tea After the Expiration Date? Tea isn't known to cause food-borne illness. In fact, tea drinking hasn't caused any infectious outbreaks in the United States, according to the Centers for Disease Control and Prevention. However, Lipton Green Tea has a "best if used by" date printed on the label, and the manufacturer of the tea suggests you drink it before that calendar date for the best cup of tea. With the exception of infant formula, food and drinks such as Lipton Green Tea aren't required to have an expiration, sell-by or best-if-used-by date on the label. These dates address possible loss of quality, rather than spoilage. The "best if used by" date on the box of Lipton Green Tea is there to indicate quality and freshness, according to the Lipton website. For clarity, an expiration date on food, which is also known as sell-by date, is meant for store owners and indicates when the food should come off the shelves. You shouldn't buy foods past their sell-by or expiration date, according to the U.S. Department of Agriculture. In most cases, it's safe to consume foods after the "best if used by" date, according to the USDA. However, if your green tea smells or tastes off, you may want to throw it away. As far as safety goes, in most cases Lipton Green Tea should be OK to drink after the expiration date. Tea isn't a major source of bacteria, but may harbor certain strains such as coliform bacteria, Klebsiella, Enterobacter or E. coli, according to Food Safety News, which may grow in number if stored for too long. 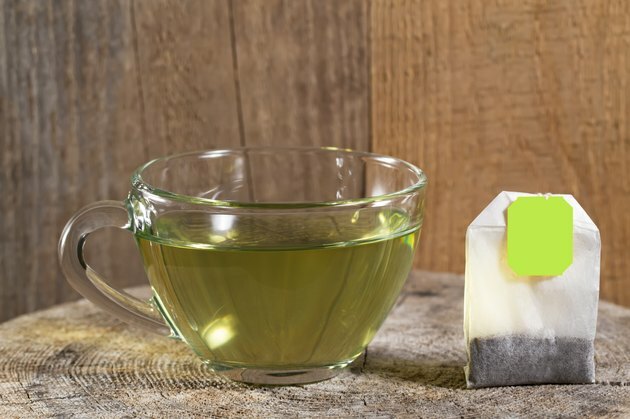 Though there haven't been known outbreaks of illness from drinking green tea, you want to make sure your tea isn't consumed too far past the "best if used by" date. Also, to ensure safety, green tea should be brewed to the right temperature -- 195 degrees Fahrenheit for three to five minutes -- to kill off any bacteria. And if you're using your green tea to make iced tea, keep it in a clean urn and refrigerated. Consuming your Lipton green tea after the expiration date may be more of a potency, or quality, issue than safety. Green tea is rich in phytochemcials that offer health benefits, such as improvement in heart health and reduced risk of certain types of cancer. When stored in your cupboard, the number of these phytochemicals in the tea decreases. Epigallocatechin gallate, which is the most abundant phytochemical found in green tea, decreases by 28 percent over six months stored in your home, according to Tufts University. Others decrease by as much as 50 percent. You might enjoy the flavor of green tea, but drinking a fresh cup offers a number of health benefits. For your heart, green tea may help lower cholesterol levels and reduce the build-up of plaque on your artery walls. As for cancer, the tea may reduce your risk of developing bladder, pancreatic or skin cancer. It may also aid in blood sugar control and has been shown to help those with type 2 diabetes manage their illness, according to the University of Maryland Medical Center. However, green tea is a source of caffeine and may affect your sleep or cause you to feel nervous or anxious. If you have a history of anxiety, kidney disease, liver problems or stomach ulcers, you should consult your doctor before buying a box of Lipton Green Tea. Tufts University: Does Tea Lose Its Health Benefits If It’s Been Stored a Long Time? And Is It Better to Use Loose Tea or Tea Bags?